The Mystery Shop performs five shows in one day! We broke our record on Monday, March 23 – our busiest day ever in our 26 year history! Kids need fun alternatives to occupy their time on the first day of Spring Break. 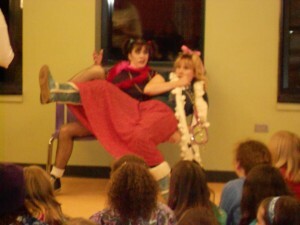 We were lucky enough to perform at a library and a park district, despite the bad weather. A repeat client, Schaumburg Library, hosted three shows: a children’s mystery for Grades 3-6 and two mysteries for our littlest detectives Grades K-2. Our children’s mystery (Grades 3-6) starts with a short play called The Legend of Pandora’s Box, presented by professional actors, that outlines the “case.” The audience work in teams to solve the mystery of what was left inside Pandora’s Box in Greek mythology. The children must solve riddles, puzzles and coded messages. They also “buy” clues with Mystery Shop Investigation Bucks. Our K-2 show is called The Mystery of the Missing Moon. Someone has stolen our moon, and it’s up to us to find it. 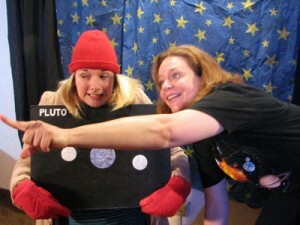 The young astronauts (with the help of MYSTERY SHOP actors) take a trip through the Solar System as they solve puzzles, question the suspected planets, and remember facts and clues about the planets. Using these puzzles and clues, the kids narrow down which of the planets stole the moon and why. The moon then reappears with a final environmental message for the young astronauts. The Wauconda Park District, another repeat client, hosted two programs. We did both versions of our CSI: Kids program – K-2 and 3-6. Kids not only solve a mystery, but help to create it as well! Our one-hour product is an interactive adventure of mysterious games, puzzles, stories and fun! It involves theatre games, a build-a-story with a mystery theme and a Create Your Own Mystery where the children have the opportunity to not only act in the story, but make decisions that move the action forward. Thanks to Mystery Shop actors Carolyn Larsen, Diana Oshiro, Mary Heitert, Irene Currie and Janel Palm as we celebrate this major milestone – five shows in one day, for the most shows performed on a single day! Book your mystery party for adults or kids at 630-690-1105 or tms@TheMysteryShop.com. We’ll be happy to “clue” you in!